Sometimes it takes another culture or cuisine to open my eyes to how a few simple ingredients can make an impressive and delicious dish. 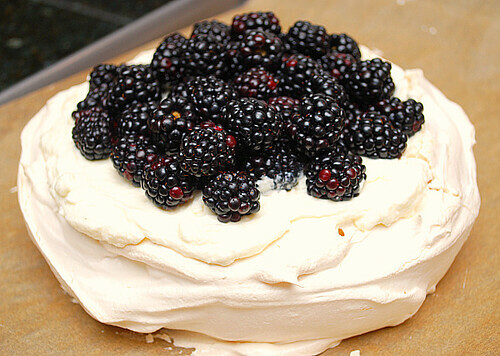 Such is the case with Pavlova, a popular dessert of Australia and New Zealand. I previously made a pavlova last year and when my friend Linda brought this dessert to our recent Wine & Dine event, I was reminded how sweet and light this dessert is! From what I understand, there tends to be some controversy with who came up with the idea of Pavlova first - Australians or New Zealanders. Regardless of where you stand, we can all agree that Pavlova is a guilt-free dessert. Made with a fluffy baked meringue that's cooled and filled with freshly whipped cream, then topped with fresh fruit, this dessert is perfect to end a heavy meal or to enjoy during the spring and summer months. I know I plan on making this dessert more often to make use of the upcoming summer seasonal fruits! Preheat oven to 300 degrees F (150 degrees C). Line a sheet pan with parchment paper. Draw a 9 inch circle on the parchment. An easy way to do this is to draw around the outside of a 9 inch pan with a pencil. In the bowl of your stand mixer or large bowl, beat egg whites on high speed until soft peaks form. Add 3/4 cup of the sugar gradually, while continuing to whip. Make sure sugar is completely dissolved. Mix together the remaining 1/4 cup sugar with the cornstarch; lightly fold into meringue with lemon juice. Bake at 300 degrees F (150 degrees C) for 1 hour. Turn off oven, but leave meringue in oven for an additional 30 minutes. When cool, the meringue should be hard on the outside, and slightly moist on the inside. In a large bowl, combine the cream and half a cup of confectioners sugar, and whip until thickened. Top with the fresh fruit of your choice. Serve immediately. Gorgeous. Thanks for the thoughtful comment on my blog. I apologize because I have been too swamped to properly comment. I joined the meetup group and cannot wait to attend an event. You also won the giveaway on my site so I will be emailing you shortly to get your info so I can send you the book. New Zealand is CLEARLY the originator of the pavlova.... but I might be biased. Loving the NZ themed recipes lately. Tell me - ever tried a timtam? Yeah, it's proven that NZ had the first pavalova. Someone researched it and found it was in our recipe books earlier than in the Australian ones, YUS!!! haha! Pavlovas always start out high, but in the cool down stage they fall flat...have not been able to figure out why, must be the altitude has anyone had this same problem? A fix for this would be appreciated. We have tried many different recipes and comes out flat every time.